Montepaschi Siena returned to its winning ways in streaking past Fenerbahce Ulker 87-69 in Group F of the Turkish Airlines Euroleague Top 16. Aleksandar Rasic came off the bench to go 4 for 4 on three-pointers in scoring a team-high 16 points for Siena, which improved to 7-2 in the group. Daniel Hackett also was a spark off the bench with 13 points, 4 assists and 8 fouls drawn, while Bobby Brown and David Moss both scored 12 points each and Matt Janning added 10. 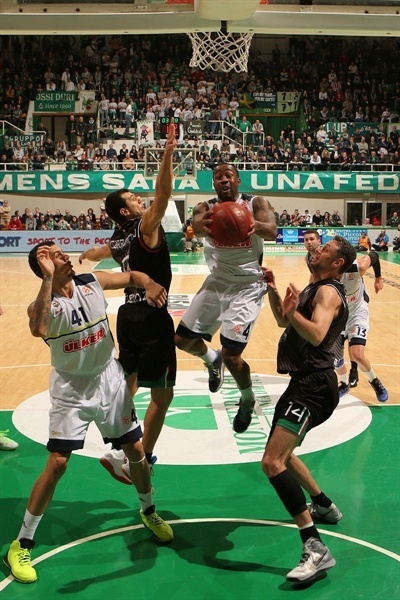 Fenerbahce dropped to 2-7 in the group despite 22 points from Bojan Bogdanovic and 10 points, 5 rebounds and 7 fouls drawn by Bo McCalebb, who returned to the court on which he starred and won back-to-back Italian league titles in the previous two seasons. 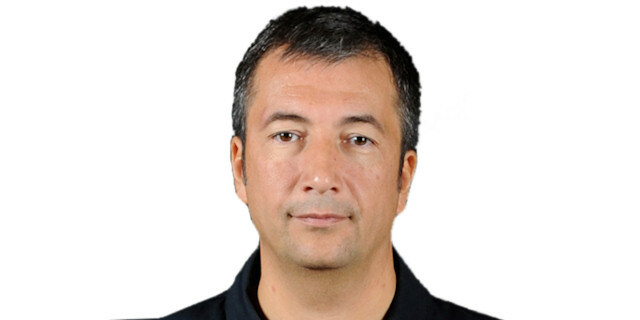 Fenerbahce’s new coach Ertuglu Erdogan, who took over after Simone Pianigiani resigned, kept the same starting lineup with McCalebb, Bogdanovic, Romain Sato, David Andersen and Oguz Savas. Siena coach Luca Bianchi also sent out the same first five in Brown, Janning, David Moss, Kristjan Kangur and Benjamin Eze. Andersen started the scoring with a fade away jumper and Bogdanovic’s three from the right side pushed the Fenerbahce lead to 0-5. Janning’s jumper got Siena on the board and Brown’s floater in the lane made it 4-7. Bogdanovic’s driving layup restored a five-point cushion before Janning and Moss buried back-to-back three-pointers to give Siena its first lead at 10-9. 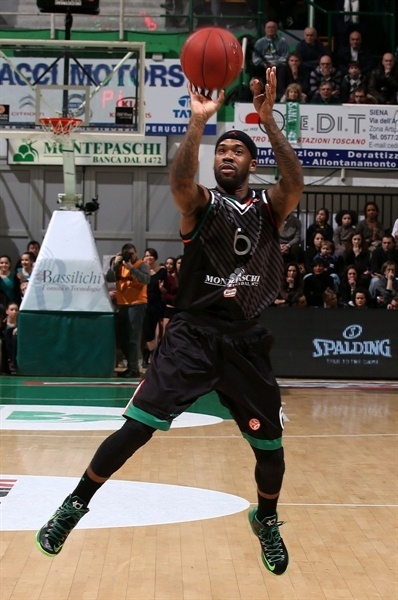 After 2 McCalebb free throws, Eze evened the game again with a foul shot and scored off a fancy interior pass from Kangur for a 13-11 Montepaschi lead. Both teams’ big men continued their fine early starts with Savaz hitting a jumper and a put-back before Eze knocked down a jumper off the glass to knot it at 15-15. Bogdanovic converted a three-point play for Fenerbahce but was answered by a triple from the right corner by Daniel Hackett and a three-point play by Brown as Siena was ahead 21-18 after one quarter. 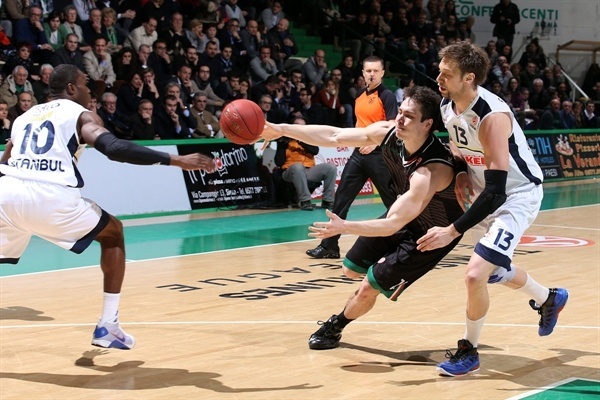 Mike Batiste’s three-point play off a pick and roll evened the game at 21-21 and Ilkan Karaman’s jumper made it 21-23. 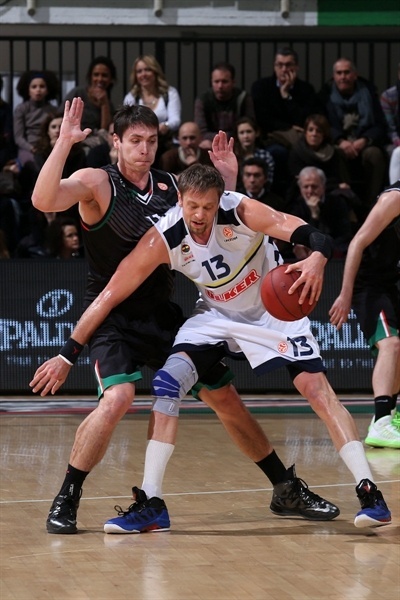 But Siena decided to turn up their defensive pressure and began to get fast break baskets. 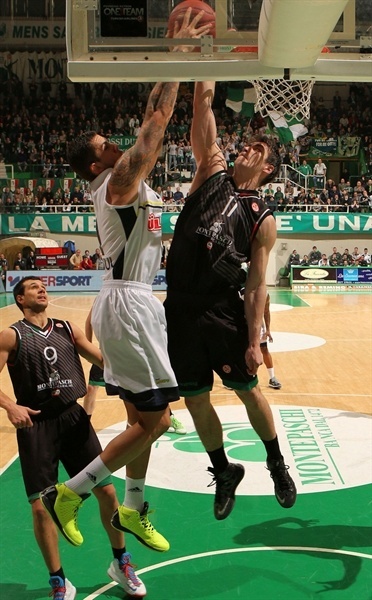 Hackett, Viktor Sanikidze and Moss scored six straight points for Siena to make it 27-23 and a Fenerbahce timeout. 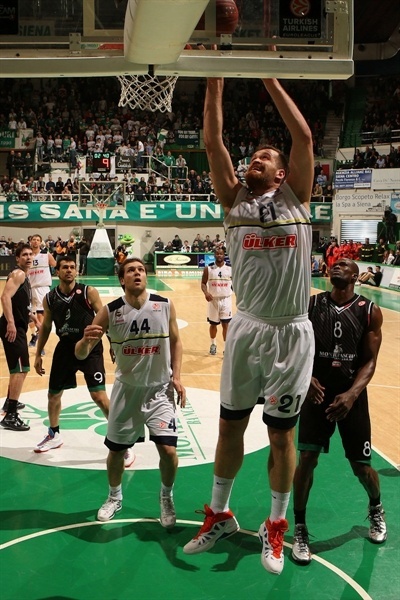 A McCalebb layup and three foul shots by Emir Preldzic brought Fenerbahce to within 29-28. 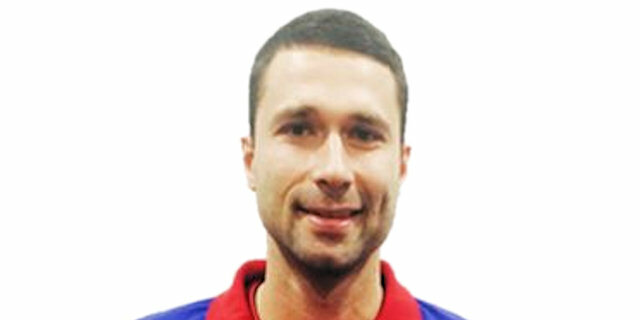 But Tomas Ress nailed a three-pointer followed by a coast-to-coast layup by Sanikidze and a Rasic layup to push the hosts ahead 36-28. Preldzic made one foul shot to slow the run but Moss made two from the stripe and Sanikidze scored again inside for a double-digit lead, 40-29, as Fenerbahce committed seven turnovers in just over four minutes of action. 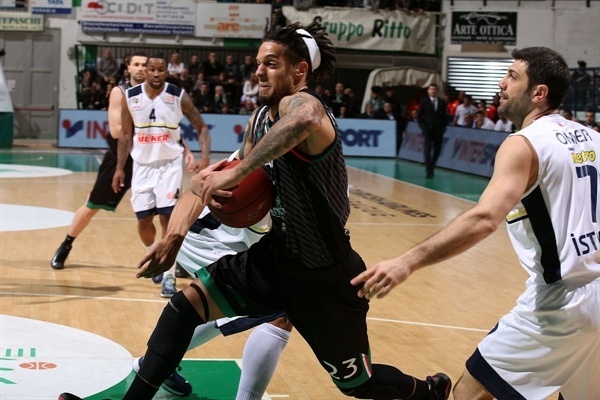 After Rasic nailed a triple, Marco Carraretto followed with two foul shots before Rasic’s jumper at the buzzer to give Siena a 49-35 cushion at the break. Moss and Brown nailed three-pointers to start the third quarter and increase the advantage to 19 points – 55-36. 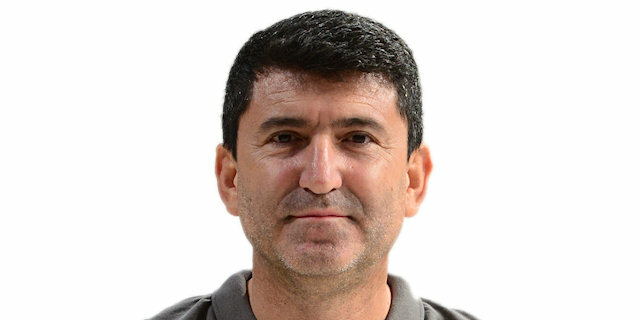 But Fenerbahce suddenly woke up with Bogdanovic hitting a layup and adding a three-point play to start an 0-11 run for the guests, including a McCalebb layup, a Savas inside score and two Bogdanovic free throws after a technical foul on Brown to make it 55-47. Kangur split two free throws to snap the 4:28 Siena scoreless drought, but Sato nailed a triple to cut the gap to 56-50. Siena worked hard and was sparked by Hackett. After two offensive rebounds on one possession, Hackett found Moss for an easy dunk. After Bogdanovic free throws made it 58-52, Hackett made a driving layup and four foul shots to push the Montepaschi lead to 64-53. A Kangur free throw increased it to 65-53 after three quarters. Fenerbahce committed two turnovers to start the fourth and watched as Rasic nail two triples as the Siena advantage grew to 71-53. 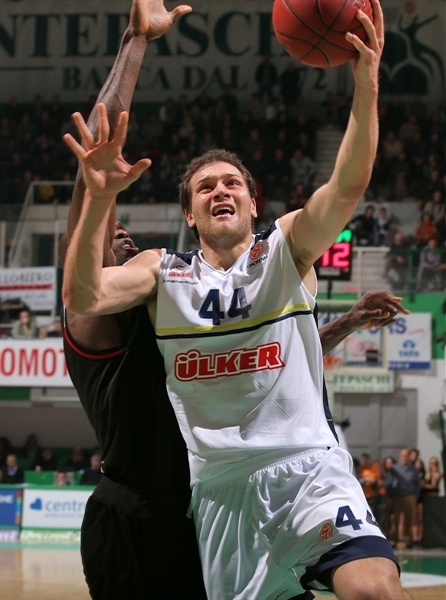 Bogdanovic got Fenerbahce on the board with a layup to make it 71-55. Fenerbahce committed two more turnovers before McCalebb made two foul shots and Batiste hit a hook to trim the gap to 71-59 with six minutes left. But Brown made a tough score in the lane, Rasic knocked down yet another three-ball and Ress hit a jumper as the cushion was back to 19 points – 78-59 – with four minutes to play. That was essentially the game though Andersen scored a basket and McCalebb and Sato each made two foul shots to cut it to 78-65. But the contest had been decided. "I’m very happy for the win, it was really important for us tonight and we played a great game, against a big team. The road to qualification is still long and tough, because there are many other teams really good that are fighting for this goal. But tonight we are really happy for the win." 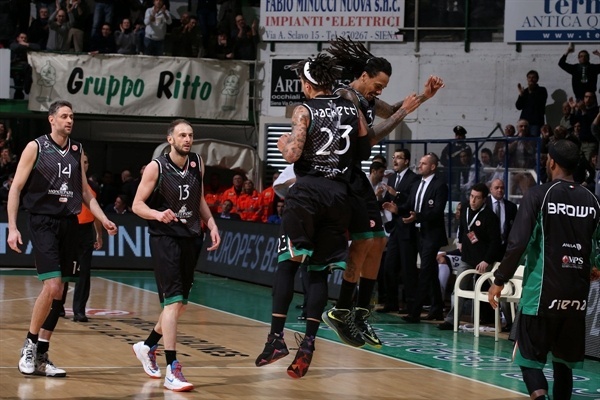 "It was a tough condition for us, because we never won here in Siena and it was an unusual period for us. We tried to fight tonight, but we found an organized and prepared team in Siena. We played good defense, but we didn’t play very good in offense, with many turnovers and we didn’t share the ball in the right way, and in this condition is very tough to win here. Congratulation to Siena." "It was a very difficult game tonight and we are really happy for the win against a great team like Fenerbahce. For us it was great to win this game and we have to try to be ready also for the next ones." "I think that the key to the game was in the second quarter in which they played well, and we made so many mistakes and that made the difference. Now we have the last five games and we will see what we are able to do. "